I try to regularly draw hands because I'm so bad at them. 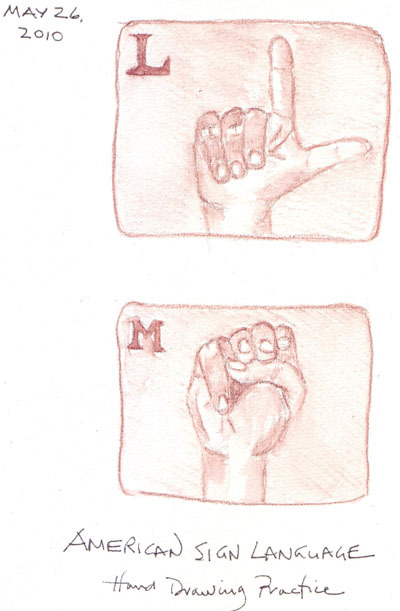 Last September I decided to also draw the American Sign Language alphabet from photos on an ASL website. I use a watercolor pencil to sketch and then add water to get shading. This is something that I do when I have nothing else to record visually from my life that day - so I'm only half way through the alphabet. It isn't obvious to me that I'm getting any better with faced with hands during live figure drawing. Maybe I need to sketch 10,000 to achieve competency. 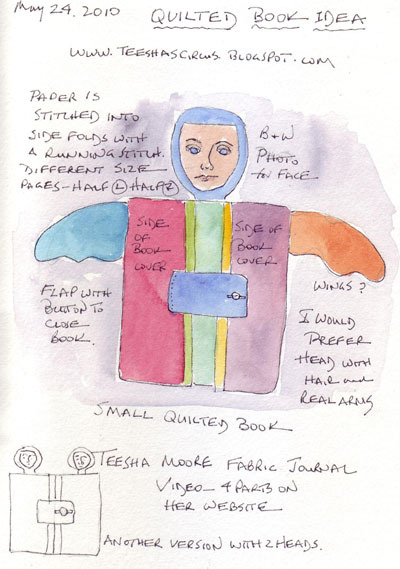 I was just about to start my daily journal page last night when I found a 4-part video on Teesha Moore's blog about making quilted books. In Part 1 she showed many quilted covers, some of which contained paper, and two of them started me thinking about another project. These two books had a cover that opened in the center and either two faces - one on each front half - or one face - in the center back. I don't know how the faces were made - transfers from photos or painted - probably the former. She makes little "quilt pillows" and then stitches them together to make her covers. I would adapt my regular quilt-making techniques and just borrow the ideas about a center front opening and faces. I'd like to put hats or paint hair on the heads and add arms, instead of wings. If I made these books for family, I would make the face theirs. So, in order not to forget the idea, my sketchbook page became drawings and notes for the project. The colors and way of coloring the book are mine. Our cousin (see last post) also has a wonderful sculpture collection, and while having my morning coffee, I chose this mother-and-child piece by Ruth Bloch to draw. There were other mother and child sculptures, by different artists in his collection, but I remember being with him one time at Art Expo in New York City when he bought a piece from Ruth Bloch - so I felt a tiny connection with her. The legs of this sculpted chair are as long as the mother - so it is a beautiful freestanding piece of art. I guess I'm not done yet with my current focus on motherhood. We stayed with our favorite cousin last evening in Philadelphia and really enjoyed seeing his lovely art collection again. 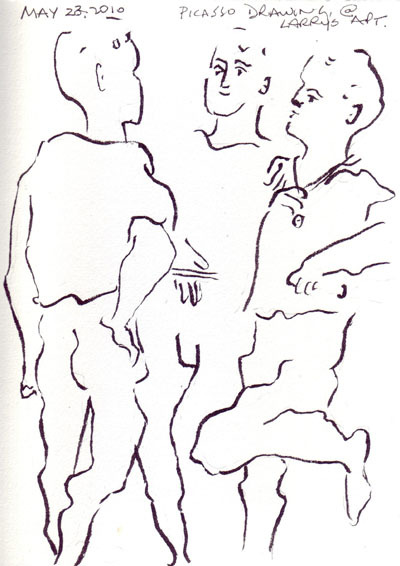 I adore Picasso drawings and like to quickly copy them trying to learn how he captures so much in so few lines. Here is a very quick sketch of one of Larry's Picasso drawings. 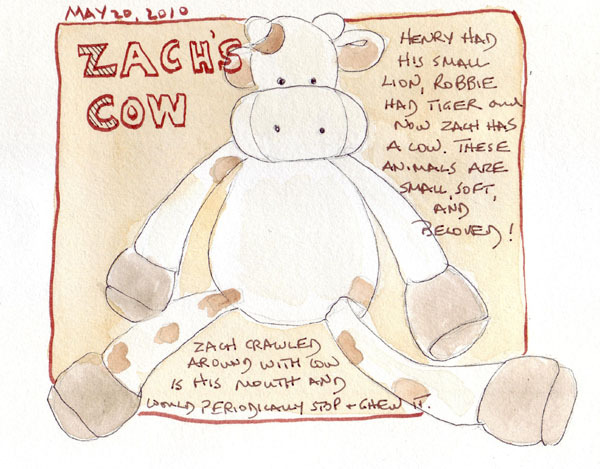 Zach has a 9" soft cow made by Gund, that he loves to chew on. Yesterday he crawled around with one of the paws in his mouth - making me want to add it to my collection of drawings of our children's and grandchildren's toys. Henry had the lion from the same collection and wouldn't leave the apartment without it. My daughter had a back-up lion collection because he was forever dropping it out of the stroller. We still have one of Robbie's Gund tigers at our apartment because he needed it for his nap on the fternoons we cared for him.